American investigative journalist, independent film producer and writer, and novelist. 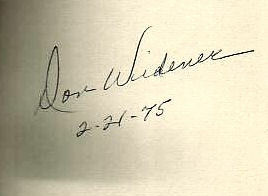 Widener ( - ) was born in Oklahoma, studied journalism at Compton College, served in the Air Force during the Korean War, and then wrote for newspapers and aerospace companies. He joined KNBC-TV in Los Angeles in where he earned two local Emmys and a DuPont award for investigative broadcast journalism. In , he became an independent film producer and writer.